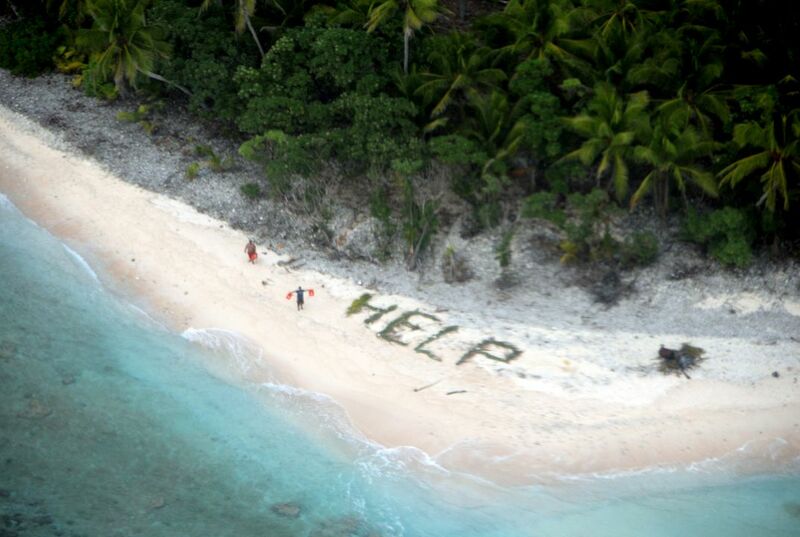 In a scene straight from Hollywood, a U.S. Navy plane spotted the word "help" spelled out in palm fronds. The word could be seen on a beach. 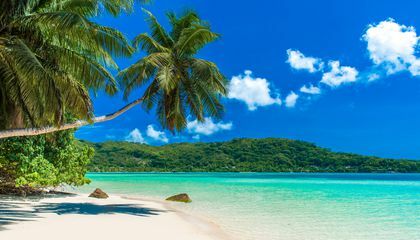 The beach was on a deserted island in the remote Pacific Ocean. The three men had been missing for three days. A wave had overtaken the small boat they were traveling in. The men were found waving their orange life jackets on the tiny Micronesian island of Fanadik. It is several hundred miles north of Papua New Guinea, officials said April 9. The men's families reported them missing April 5. The men had failed to show up at the Micronesian island of Weno. They were traveling there from their home island, Pulap. "Fortunately for them, they were all wearing life jackets and were able to swim to the deserted island," U.S. Coast Guard spokeswoman Melissa McKenzie said. A boat picked the men up and took them to a hospital. Officials told The Washington Post the men were not injured. Two cargo ships searched a combined 17 hours for the men as part of AMVER. It is a Coast Guard voluntary search and rescue program. With AMVER, rescue coordinators can identify participating ships in the area of distress and ask them to help. In the last two weeks, 15 people have been rescued in the Pacific with the help of 10 AMVER vessels and six aircrews, the Coast Guard said. Would you pay $394,000 for the chair where Harry Potter was born? Why was “Help” the perfect word? It was a perfect word because any one would know what that would mean.If you spotted the sigh you would know the need for those three men.Which would be safety. I was surprised that they survived three days stranded on a island considering all they had were life jackets.I know I wouldn't be able to survive. Help was the perfect word for their situation because it was the exact thing they needed.They where stranded on a desert island and didn't have many materials to signal help with so the only way they could signal nearby aircraft to come help would be by making a sign out of sticks that spelled help so people would know.It was also the perfect word because it was the one that lead to them getting off the island. Thank god for the rescuers. Help is the ideal word for needing rescuing because we've all seen it in movies and it's probably the first word that comes to mind in a serious situation such as this. I agree TOTALLY!!!!!!!!!!!!!!!!!!!!!!!!!!!!!!! !!!!!!!!!!!!!!!!!!!!!!!! !!!!!!!!!! I've seen the situation in Alvin And The Chipmunks Chip Wrek. Ha-ha get it?! "Help" is the perfect word because help is what they needed. Help is the perfect word because everbody knows the word and the people can know that well you know they need help. plus its probably the first word people think of. According to the article "Rescuers spot "Help" on the beach", why was help the perfect word. First of all, the article states that the men were stranded for 3 days on that deserted island. The second reason is that cargo ships searched for 17 hours for the three men. Finally, the people needed help to get of the island. In conclusion if you are stranded on an island just stay calm and search for help. Help was a perfect word because the plane that was flying overhead spotted it very easily and were luckily able to save the stranded men. It was the most recognizable word they could use.